Backed by popular demand we have now updated Continue to Give's online giving software to bring you the option to either require your donor's address or make it optional. This is a great feature if your organization needs full addresses to keep in contact with your donors after the donation by sending out physical mailings. We have also kept an option for organization that wish not to require the address field so that there is less to fill in on the donation. To turn on the feature go to your account settings and then click on your "Edit Profile" tab on the left column. Click "Yes" to require address from your donors and click save. Even if it looks like the Yes is already marked still go ahead and click it and save. If you turn on the address required field for your organization it will require an address for each and every project and missionary as well. If you have your address field set to NO for your organization you can choose each project and missionary if they need to have a required address or not. Can you customize this for special projects? Yes. If you choose to set your organization to No you can still require addresses for specific projects. Just go to edit your project and now you will see an option to require address. Select "Yes" and save. How does the Offering Kiosk fit in? If you have your offering kiosk set to Point of Sale mode this will still never require an address. Also if your donor wants to give as a Quick Card Swipe this will not require an address. With the kiosk the only options to require an address are Give as Guest, Create an Account, or the Log In. However, if your giver puts in their address once you will have it save to their account and your reporting for future donations. 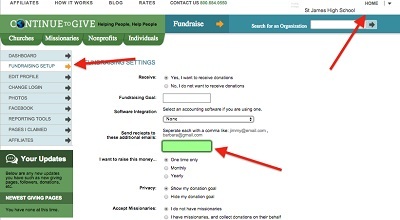 Do you need multiple people to receive emails when a donation happens? Continue to Give's software sends out donaiton notifications for each and every transaction. So this means when a donation goes through your donor will get a confirmation receipt as will the main login email of the organization administrator. This is especially important when a donation fails. Failed donaitons will also trigger an email confirmation of the failed transaction along with the reason it failed. If you would like other people in your organization to receive these transaction confirmation emails of complete, pending, and failed transactions you can add them into your additional recipient setting. While logged in go to your dashboard by clicking on the "My Setting" then Account Settings button. To learn more about navigating your account click here. 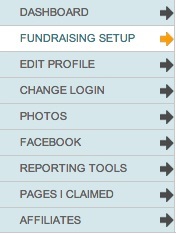 Click on the "Fundraising Setup" tab. Fill in your emails and then scroll to the bottom and click save! Add a personal touch to your automated receipts. Tell the donor how much their donation is going to impact the world and make it a better place. Give them a personal message and give appreciation to the donation the donor gave. Don't forget to SAVE all your changes! Congratulations! You now have a custom message for your receipts! There are a three different ways you can display your fundraising goals. 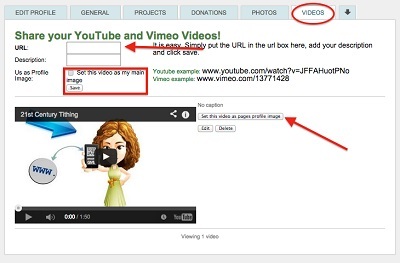 You can show your goal amounts and add a world thermometer or hide you donation traffic. It's all up to you! You can display your goal amount for everyone to see and watch as your world thermometer fills. This option is great for missionaries as you have to have monthly support and can set your goal amount to monthly! When you choose to display your goal you also choose to display your world thermometer! Thermometers are proven to help increase donations as your viewers see how close or far away you are from reaching your goal! Or you can hide your goal amount so it is not public. You can also choose if you want to display your amount raised so far.